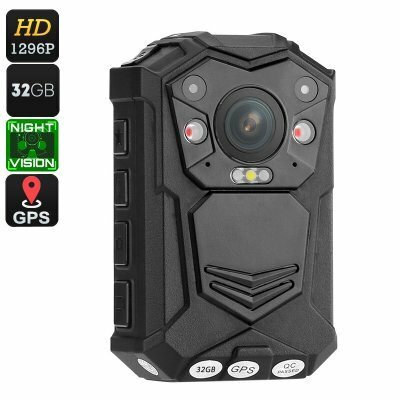 Successfully Added Police Body Worn Camera - 10M Night Vision, 1296p, 140 Degree Lens, CMOS Sensor, IP65 Waterproof, 2 Inch Display, Time Stamp to your Shopping Cart. As the ultimate security gadget, this Full-HD body worn camera offers great security throughout your upcoming shifts as a security guard, police officer, or bouncer. With its 140-degree lens, this body cam captures everything that happens in front of you in crisp 1296p resolution. This takes away any risks of ever being bothered again by false insurance claims or accusations over minor disputes that took place during your working hours. Allowing you to add watermarks, user IDs, time, GPS locations, and date stamps to all your footage – this police body camera delivers useful security footage for analyzing dangerous situations. Additionally, it comes with a 2 Inch LCD monitor on which it allows you to instantly watch back previous recordings. With 32GB of memory, there will be plenty of space to store all video captured throughout your upcoming working days. Featuring a high-end 5MP CMOS sensor, this FHD body cam treats you with highly detailed images. A powerful 2900mAh battery lets you record footage for up to 10 hours in a row – enough to get through multiple shifts without needing to worry about battery life. This body worn camera comes with a set of clips that makes it easy to attach it to your belt or uniform. When not used as a body cam, it can additionally be used as a car DVR system when attached to your dashboard. Supporting motion detection, this body camera automatically focuses on movement and starts filming instantly whenever a moving object is detected. This body worn camera features a tough IP65 body that allows you to use it outside no matter the weather conditions. Capable of withstanding water, dust, and drops – this police body cam can be used in any environment imaginable. Additionally, it comes with 4 Infra Red LEDs thanks to which you’ll be able to use this body worn camera both at day and night. No matter the time of the day, thanks to its 10m night vision this police body camera delivers clear and detailed footage at any time. Supporting 16x zoom you’ll be able to record suspicious situations from afar and a built-in microphone captures all sounds in your surroundings.